Why do you like Joey Scouts? I like Joey Scouts because I love being with all the other kids. The leaders are really nice and we do lots of fun things. What are your favourite activities at Joey Scouts? I love them all. It’s great when we go sailing or do activities at the beach but I also love the games in the hall. Sometimes we go on little excursions like the fire station. What is your greatest achievement in Joey Scouts? Going on the Kangaree camp and getting my badges. I also loved selling raffle tickets at Woolworths in Brighton and sausages at Bunnings. What's they best Joey Scout memory for you? I really loved the sleepover at the hall when we all camped in tents with a big open fire and pizza. What’s been your most fun experience? I loved going on the Kangaree. It was my first weekend away from home on my own but it was fantastic. The food was great, the activities were awesome and we all slept together in a big hall. What has been your most interesting night? Apart from the sleepover, I really enjoyed going to Landcox Park in the dark with our torches to hunt for possums. My group saw a white owl. What has been your funniest experience? We went to Karkarook Park sailing and my friend and I jumped out of the boat into the water with our lifejackets on. What has been a great water activity experience? I love them all but one activity I really enjoyed was going to Ricketts Point and looking at all the sea life in the rock pools. 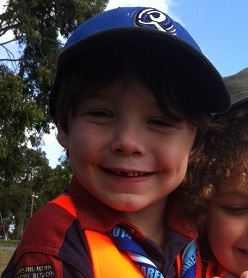 Would you recommend Joey Scouts to other children? Definitely, because we get to do lots of different things that some of my friends never do like sailing. It is also good to make new friends from different schools. My favourite TV show is Bushwacked and Camp Lake Bottom on ABC 3. Yes. I was and wasn't and then I was again....long story!! What prompted you to train as a Joey Scout Leader? Initially it was to tick off my CAS (Creativity, Action, Service) hours for my International Baccalaureate at school. It is an important responsibility looking after 20+ small children and the parents put a lot of trust in the leaders. It's a great feeling to feel trusted by both the parents and the Joeys. I really like doing the Joey Hop with the Joeys when we have parade.....it's so much fun. What sort of things do you do with your Joeys? We do many things that the other sections do like sailing, canoeing and kyaking, but regularly spend the hour allocated each week in the Scout Hall doing fun activities. The sound generated by over two dozen young children can be quite loud! At a recent vist to the Melbourne Zoo I had the opportunity to lead a game of "Let's Be An Animal" with Joey mobs from other Scout groups, where we would make our way to various exhibits acting like the animal we were about to visit.